The rising curve of global temperature has spurred a literary blizzard. 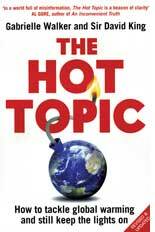 There are books about the science of climate change, a variety of journalistic output. It might not be easy to pick one through the squall of information. In The Hot Topic, David King and Gabrielle Walker promise to "unpick the entire essential story of global warming--what we humans have done, how we have done it, how we will need to prepare for the changes we can't stop". Their credentials are impeccable: King was the UK government's chief scientific advisor from 2001 to 2007 and Walker is an accomplished science writer. The authors have chosen a simple format. They guide the reader through the history of climate science, the projections and uncertainties, the solutions and politics. After an engaging discussion of the greenhouse effect and its discovery, taking in key players such as Joseph Fourier and John Tyndall, they examine the palaeological record and the evidence for human-induced changes in climate. King and Walker do a fine job of setting out the issues. Climate change is cast in the language of a problem-solution dialectic: the problem is big--indeed, "the biggest one facing mankind" --but solutions exist. Does such a dialectic really work in this case? Walker and King show that it does. They label geoengineering proposals, such as injecting clouds of sulphur dioxide into the atmosphere as dangerous tinkerings that trade one kind of pollution for another. Instead, they draw together an impressive arsenal of renewable energy sources. 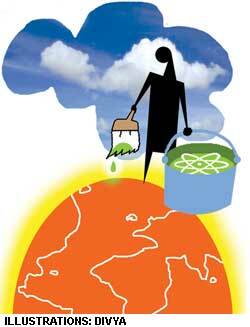 They are also upbeat about nuclear energy and new technofixes such as carbon capture and storage. Such pessimism seems unfounded. Nuclear energy has a dubious record and no one has done a cost-benefit study of carbon capture and storage. A lot of King and Walker statistics are drawn from the UK. They contend that a new generation of more efficient nuclear power plants would create less waste, adding just 10 per cent to existing UK levels. But for a country that is already home to 100,000 tonnes of radioactive waste, this additional material would prompt a hefty rise in the cost of long-term storage. The authors' positive view of nuclear energy also does not square with their scepticism over the pollution-swapping risks of geoengineering. They are at their best in the section on personal solutions. The section covers familiar territory. But the authors writing skills make their arguments persuasive and convey the urgency of the situation. The section also leaves us greedy. This is because King and Walker offer very little from the social sciences, from religion and ethics. Walker and King's account does not always stand up to their stated goal to "tell the facts" and not to find a disaster around every corner is laudable. There is enough material to give sleepless nights to even the most optimistic of us.